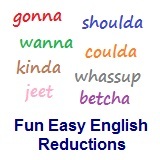 ﻿ Fun Easy English - new-american-english-reductions-reduced-words-topic-word-to-ought-to-oughta. In this lesson you will learn the American English reduction oughta. We oughta go before it begins raining. They oughta change the team uniforms. She oughta study for the college entrance test. He oughta think before speaking. Yeah this is kind of a strange reduction but it is used a lot in English conversations. You oughta eat something before you leave. Reductions, such as oughta are not real words in English. Alanis Nadine Morissette (born June 1, 1974) is a Canadian–American singer, songwriter, multi-instrumentalist, record producer, and actress. Known for her emotive mezzo-soprano voice, Morissette began her career in Canada in the early 1990s with two mildly successful dance-pop albums. Afterwards, as part of a recording deal, she moved to Holmby Hills, Los Angeles and in 1995 released Jagged Little Pill, a more rock-oriented album which sold more than 33 million copies globally and is her most critically acclaimed work. Her follow-up album, Supposed Former Infatuation Junkie, was released in 1998. This video is a good example of the usage of "oughta", and "gonna" English language reductions.